This post continues a series of examples on Advanced Expression-Based Filters for Metacoda Plug-ins, in this case for the ACE Reviewer. Tree Branch ACEs: show explicit permissions on folders and objects underneath the /Vegas Enterprises/HR metadata tree branch. Many of the Metacoda Plug-ins have Filter Bars which provide a way to filter the contents displayed and show an interesting subset. Normally they do simple case-insensitive “contains” filtering on key attributes like name and description (the filter bar label indicates which attributes are used). Simple text filtering, as described above, is sufficient for many needs. However, for more advanced requirements there is the ability to switch to expression-based filters which are much more flexible. To use expression-based filtering you add a #@ prefix at the beginning of the filter bar field. What follows is then an expression that can use many of the other attributes/columns available in the tables. This expression is written as a Java like expression (BeanShell to be precise) and must resolve to a boolean true/false to determine whether a row should be shown in the table. Any errors in the expression will be shown in a popup error dialog. This is the first of a series of quick-tip type posts on Metacoda Plug-ins. Most of my previous posts have been relatively long (and less frequent). These quick-tip posts will generally be shorter and hopefully more frequent (time permitting). They will mostly be of use to Metacoda customers and may include links to the appropriate documentation pages (login required). I will the posts with “Metacoda Plug-ins Tip” so you can browse the collection if you want (currently a collection of 1!). To kick the series off, this post is about the forced-refresh preferences. 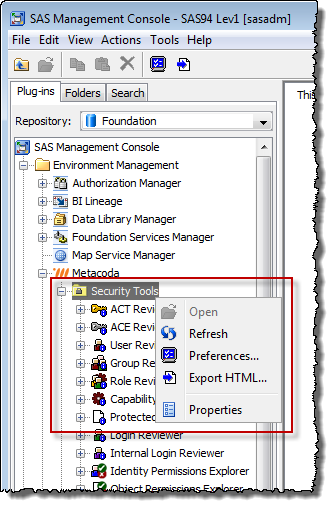 These are preferences that control whether or not Metacoda Plug-ins will refresh its cache of SAS security metadata prior to exporting HTML, CSV and Security Test XML files. You will find these preferences as check-boxes located in Security Tools Common Preferences available via the Preferences context menu item from right-mouse clicking over most of the Metacoda Plug-ins.